As we look back on this past year, we're reminded how GROW parents and neighbors, GROW partners, GROW school leaders, GROW teachers, and of course our inspiring GROW students reached for the stars and set an example for families and educators across the city to embrace their neighborhood schools. There were so many exciting developments for GROW and our community of schools in 2017. Here are just some of the highlights! 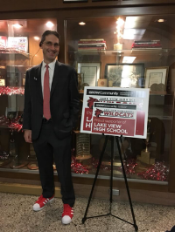 We began the year welcoming Paul J. Karafiol as Lake View High School's new contract principal, a vote of confidence in his effective leadership as the school’s interim principal. We took GROW on the road and hosted “An Evening with Amundsen and Lake View High Schools" on March 7 at Hawthorne Scholastic Academy. We had around 300 students and parents from more than 25 different public and private elementary schools, and attendees spanned the grades, from 8th grade down. GROWCommunity joined a growing chorus of educators and researchers advocating for strong neighborhood schools. We participated in an event hosted by Generation All called "Perceptions V. Reality: What To Consider When Choosing a CPS High School.” University of Chicago Consortium on School Research director Elaine Allensworth shared the Consortium finding that high-achieving non-selective high schools (including neighborhood high schools) are on par with selective high schools when it comes to "taking Honors/AP classes, time on homework, attendance, sense of belonging at the school, standardized test scores, graduation rates, college enrollment, college persistence." We’ll continue to take that message out into the community. Check out Generation All’s recap of the evening. Injecting fun into fundraising, Friends of Amundsen’s Celebrity Bar Night fundraiser was a huge showing of support for Amundsen sports and clubs at Rojo Gusano Restaurant. April saw the launch of the GROWCommunity Ambassador Program, a new initiative to help facilitate our work with GROW's 17 elementary schools and two neighborhood high schools, Amundsen and Lake View. Thank you, GROW Ambassadors! GROWCommunity, along with Amundsen and Lake View Local School Council community representatives, co-hosted an On the Table dinner in the Amundsen library. This event brought together a mix of GROW community members, parents and educators for an insightful and productive conversation about our neighborhood schools, which culminated in an Acting Up award from The Chicago Community Trust for our GROWCommunity Gardens! June brought the fantastic news of renewed and increased support for GROWCommunity from A Better Chicago, a venture philanthropy organization that supports high-performing local education nonprofits. A Better Chicago’s commitment has allowed us to launch a range of first-time outreach activities bridging our elementary and high school communities, to deepen our partnership with UChicago Impact at the University of Chicago to provide professional learning for school improvement, to establish the organizational building blocks for a strong community-driven nonprofit, and much more. GROW schools continue to attract and nurture enriching partnerships: Lake View High School announced a new partnership with Northwestern University and debuted a renovated weight room, thanks to support from Cubs Charities, and a new maker space with support from Friends of Lake View. Amundsen's partnership with The James Dyson Foundation expanded to include a new engineering lab and engineering curriculum. Read an article about the partnership, and watch the video. We hosted GROWCommunity Trivia Night at A. J. Hudson's Public House. Both Amundsen and Lake View were featured in articles on social-emotional learning in CPS: Amundsen in The Christian Science Monitor and Lake View in the Minneapolis Star Tribune. Lake View's valedictorian shared her inspiring story on NBC 5 Chicago. Also check out the DNAinfo article about her story and this Instagram post by a local journalist. Lake View's Social Justice Club created Facing the Divide, an outreach program including an exchange with a high school in rural Blanchardville, WI. The program was featured on WBEZ. ICYMI: Check out the WBEZ story featuring Amundsen and Lake View and the swell of community support for our outstanding neighborhood high schools. All Saints' Episcopal Church included GROWCommunity in its September back-to-school education panel, part of its annual Backpack Blessing. GROWCommunity executive director, Sarah Makela, moderated the discussion with a panel of CPS arts educators. We kicked off October with a successful GROW/Northcenter High School Fair at Lake View organized by GROW elementary counselors. More than 300 middle-school students and parents had an opportunity to visit with Lake View, Amundsen and other exhibiting high schools and to hear from Lake View principal PJ Karafiol and Amundsen principal Anna Pavichevich. There were also presentations about the new GoCPS high school application and the GROWCommunity Enrollment Policy -- that eighth grade students from any of the GROW elementary schools who apply to Amundsen or Lake View through GoCPS will be guaranteed admission, regardless of where they live. Amundsen celebrated earning the highest CPS rating of Level 1+. "This isn't something neighborhood schools don't or can't do," Amundsen Principal Anna Pavichevich told DNAinfo. "It shows we're competitive, it shows our students are capable of achieving at the highest level." 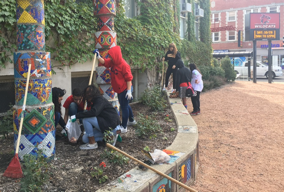 Wrapping up October, GROWCommunity, along with students, parents, teachers, administrators and community members, planted more than 1,500 spring bulbs at Amundsen and Lake View high schools as part of our Community Gardens Event. GROWCommunity hosted a webinar about the GROWCommunity Enrollment Policy for GROW 8th grade families to learn more about applying through GoCPS. In a galaxy (not so) far far away…Friends of Lake View launched its first fundraising initiative, partnering with the Davis Theater for exclusive opening-weekend showings of Star Wars: The Last Jedi to benefit Lake View High School. Chicago Cubs Charities generously matched $25,000 raised at this event. Don't miss the hilarious Lake View student-produced video teaser here. Here’s to keeping GROW growing in 2018! And as we look forward to the new year, there’s still so much we can do. And we can’t do it alone. GROW is fueled by your passion and creativity for developing a seamless K-12 system of public neighborhood schools that are the top educational choices for families in our community. Stay involved. Donate a few bucks. Share your ideas. Grab a lawn sign or two. Recruit your neighbors. Share this year in review!